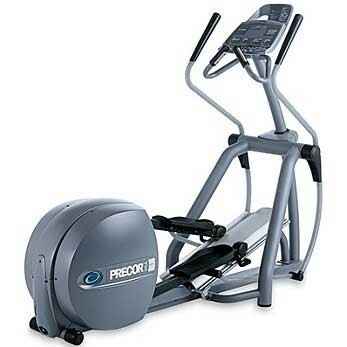 The Precor EFX 556i Elliptical offers exercisers a total-body elliptical experience. Constructed with the same sturdy, powder-coated steel frame as earlier Precor models, the 556i adds the use of moveable arm-handles to the mix to incorporate the upper body in the workout. The Certified Pre-Owned Precor EFX 556i Elliptical offers exercisers a total-body elliptical experience. Constructed with the same sturdy, powder-coated steel frame as earlier Precor models, the 556i adds the use of moveable arm-handles to the mix to incorporate the upper body in the workout. The 556i also actively recruits other muscles, such as the glutes and quads, to render a better total-body challenge than stairclimbers, stationary cycles, or treadmills can provide. In keeping with the user-friendly nature of other Precors, the 556i employs the Tap Control™ monitor inputs, which alert the rider of any in-program changes with a reassuring “click”. The 556i ramp is set at 20-degrees for optimal muscle-fiber recruitment. And you won’t get bored on the more modern Precors, as they are equipped with fully-integrated Cardio Theater entertainment systems. Just pop-in your iPod, Zune and other modern technology for further enjoyment (the 556i comes with optional personal viewing screens, as well). It’s also easy to make room for your 556i; it takes up minimal floor space, fits through most doorways, is easy to move, and because it’s self-powered, there are no messy cords.